Providing the Best Quality Residential and Commercial Flag Poles! Over the past two decades we've sold commercial and residential poles to businesses and residences in every state of the Union. 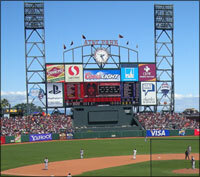 In the United States, we've gone from coast to coast - from the dozens of poles in the Carolina Panthers NFL stadium to the nearly 100 flagpoles in AT&T Park (formerly Pacific Bell Park) in San Francisco. During the 2002 Winter Olympic Games, over 3,000 flags and banners hung from the commercial flag poles and hardware supplied by Colonial Flag. But we didn't stop there! Colonial's flags and poles have been shipped to, and installed all over the world, including a 200+ ft flagpole in Mexico City, Mexico. No matter how big or small the job, whether it's the tallest known flagpole in the United States (200 ft flagpole in Dorris, California) or a 10 ft aluminum flag pole in your neighbor's yard, we'll help you fly your flag safely, and proudly. 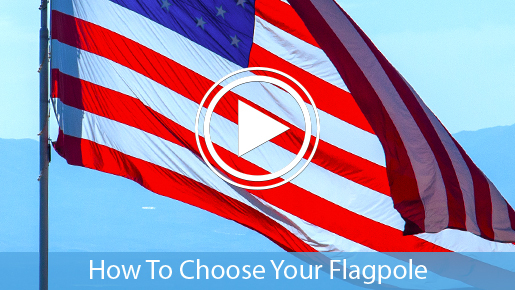 Online we offer you a great selection of high quality flagpoles, ranging anywhere from residential and 15 ft aluminum flag poles; all the way up to 80 ft aluminum poles. Just select from any of the pole subcategories listed above or watch the product guide video above for quick selection. You'll find a huge selection of commercial, residential and custom poles for less here at Colonial. Order online or for flag poles over 80 feet, please call us today at 877-941-3542 or Contact Us Here.